Released: Runecast Analyzer 1.7 with vSAN Support - VIRTUALIZATION IS LIFE! Runecast has released version 1.7 of their Analyzer today and it has added support for VMware vSAN. By using a number of resources within VMware’s knowledge base Runecast offers a platform that looks at best practices, log information and security hardening guides to monitor your vSphere infrastructure which in turn brings to your attention issues through a simple yet intuitive interface. This now extends to vSAN as well. Also in this release is an improved dashboard called the VMware Stack view and improved vSphere Web Plugin. Version 1.7 focuses on VMware vSAN support and proactive issue detection with remediation. vSAN, having gained market lead in the HCI space is deployed in vSphere environments more commonly these days as the storage component. It is critical to not only monitor performance but also keep the vSAN configuration in the best condition and prevent from any future failures or outages. Runecast Analyzer v1.7 scans vSAN clusters and looks at cluster configurations against a large database of VMware Knowledge Base and Best Practices rules. 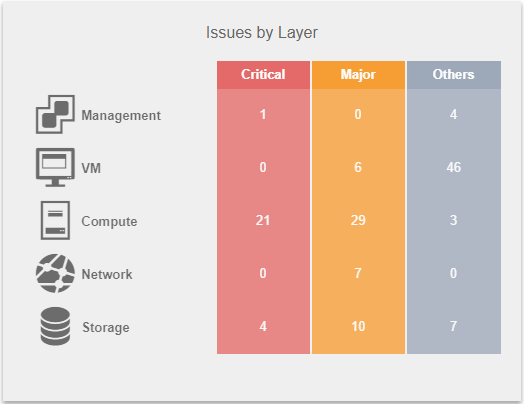 This results in the ability to list issues and then offer suggestions on how to fix those issues which may affect vSAN availability or functionality. This acts as a good way to stop issues before they become more serious problems that impact environments. As mentioned version 1.7 also offers an upgrade to the vSphere Web Client and as you can see below the integration is tight with the HTML5 client. Finally, I wanted to highlight the new VMware Stack dashboard. This new visual component aims to very quickly prioritize what problem to solve and where it exists. The VMware stack contains 5 layers, Management, VM, Compute, Network and Storage. Runecast prioritizes and sorts all detected problems into those five categories so an admin can easily see where the critical issues are and what is the risk they pose. Overall for those that have vSAN in their environments I would recommend a look at this release. The guys at Runecast are taking a unique approach to monitoring and I’m looking forward to future releases as they expand even more beyond vSphere and vSAN. The latest version is available for a free 14-day trial.